James Caldwell was born in April 1734. Caldwell is remembered as "The Fighting Parson of the Revolution." He became Pastor of the First Presbyterian Church in Elizabeth, NJ (called "Elizabethtown" then), in 1762. When the Revolutionary War started, he threw his full backing into the Patriot cause, and served first as an Army Chaplain, then as a Commissary for New Jersey Militia troops. 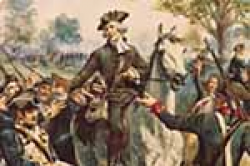 His place in history was secured during the June 1780 Battle of Springfield, NJ, which was destined to be the last major engagement in the Northern part of the colonies during the war. British and Hessian forces, intent on trapping General George Washington's depleted army at Morristown, NJ, invaded from Staten Island, taking Elizabethtown and Connecticut Farms (today's town of Union NJ) after resistance of New Jersey Militia men and Regular troopers under Colonel Elias Dayton. Reverend Caldwell's wife, Hannah, was shot and killed during the struggle at Connecticut Farms, the deliberateness of which is still being debated today (some accounts state she was intentionally shot, others say she was killed by stray bullets). Whatever the true circumstances, her death became a defender's rallying cry, and Caldwell took part in the Rebel resistance a few days later in Springfield as the outnumbered men under Colonel Dayton fought to repulse the foray. He has gone down in Revolutionary War lore for, when supplies were running low, grabbing hymnal books containing Isaac Watts' hymns out of the nearby Springfield Presbyterian Church, and giving their pages to the soldiers to use as wadding for their muskets, exhorting the famous lines "Now, boys, give 'em Watts! Give 'em Watts!" The combination of Regulars and Militia men repulsed the English attack, but not before the British and Hessian soldiers burned all but five structures in the town. Reverend Caldwell was hailed as one of the heroes of the day, but did not live long to enjoy any acclaim. In November 1781 he was shot by a sentry and accounts of the incident, like that of his wife, differ whether it was an accident or deliberate. He now lies next to his wife in the yard of the Church he served for nearly 30 years. The town of Caldwell, NJ, was named in his honor. James Caldwell was killed on 24 November 1781. He is buried at the First Presbyterian Churchyard in Elizabeth, NJ.